It’s a pretty well known expat fact that Qatar is one of the more expensive places to live in the region. And of course, at the end of the day, everyone loves a bargain. Especially me, the week before payday. Well, actually any time. So that’s why you can always find my purse stuffed with Entertainer vouchers. The Entertainer has been offering great value offers for everything from Michelin-star restaurants to casual dining and cafes through their two-for-one vouchers books since 2001 and this year they have gone digital. They have launched an app that makes it easy to use at outlets spontaneously. It’s GPS based so you can source offers wherever you are. No more voucher stuffed purses! Plus each merchant has three offers, so you can go back for more in 2014. Which brings me to last week. Erswhile Wedge dining companion Alicia and I headed to La Varenne, probably Qatar’s only French brasserie. I was just coming off a week of the flu and sometimes, a gal just needs a steak, a glass of red and some gossip. The only things better than the view at this place (it’s on the 28th floor) are the steaks, the service and the Damien Hirst at the front door. OK that’s a few more things! The menu runs from the traditional French onion soup through to rustic pot au feu and of course steak frites. 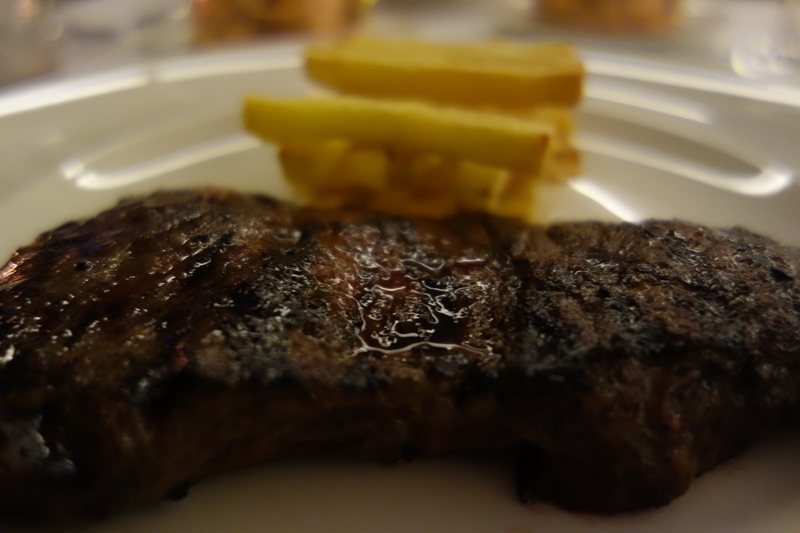 The steak was tender, cooked just as I had asked (medium rare, more rare than medium) and served with just right chips (sorry, FRITES). Alicia and I love a coupon, and a bargain and using the app which was quick and easy, we were able to save more than QR115. Now that, is an entertaining proposition. *The Entertainer Qatar mobile app is available through itunes as well as through Blackberry World and Google Play for AED350.